Now that there is such a thing as Sun Awareness Week, I thought it might be useful to round up our Sun Safety activities for you. It's a good opportunity, before the sun comes out in force for the summer (we hope) to remind children of the need to protect their skin sufficiently - either by covering up, limiting exposure, or wearing suntan cream. And while you are about it, you might mention the need to stay hydrated too. Our sun safety resources include a simple word search puzzle, a very popular set of dolls (complete with suitable clothing, hats, sunglasses, water and sun cream) and an activity sheet. We've also got two versions of a useful reminder poster, and a sun writing frame. Perhaps you could ask children to write down the ways that they would stay safe in the sun inside the frame, and colour it in. For younger children you might prefer to do a simple colouring activity, sun craft or lacing card. 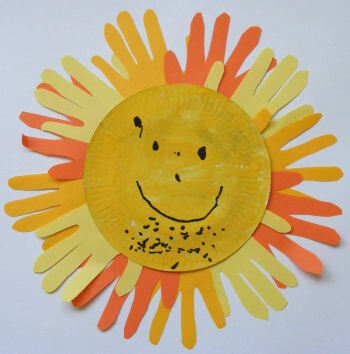 You can find a selection of ideas below, including one of my all time favourites - the sun handprint craft! The British Association of Dermatologists, who are behind Sun Awareness Week, have a range of printable posters giving further information on their website, here. The "Save our Skin" poster is particularly useful, with its catchy "Slip on a shirt, seek out shade, slap on sunscreen" message.